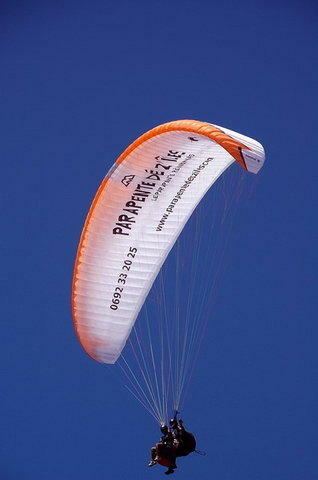 Parapente Dé Z'îles offers various types of discovery flight using two-seat paragliders. 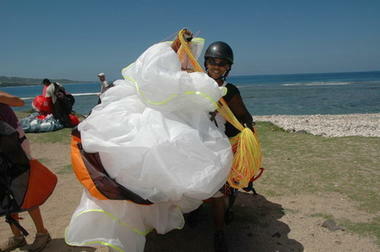 Tandem flights named "Ti paille en Ké" or "Papang". Our favorite flight is “Le Gadiamb”, a different way of flying. After taking off, the control of the glider will be given to the guest. He will be the pilot during the flight time. Parapente Dé Z'Îles offers discounted rates for children, students, family. Special rates also for work’s council, school, associations, tourists accommodation.